It is nice that Mr. Clevenger has his baby daughter overlooking these tweets....but that is another story. 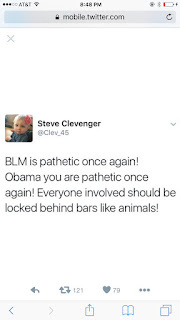 After these tweets, the sportswriters in the country(who have never been afraid to jump on their high horse), started calling for the immediate release of Mr. Clevenger. Personally, I find what Steve Clevenger tweeted to be deplorable, BUT I do not think that he should be "immediately released". Having a stupid, racist beliefs and opinion should not get one fired, it also should not make you the Republican nominee for President but that is also another story. 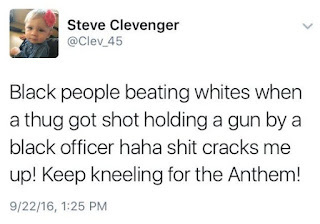 Recently, prominent columnist from the Chicago Tribune, Steve Kass, wrote basically the same thing as Clevenger's tweets in long form, in a recent column. No one has called for Kass to be fired, as a matter of fact, our friends at Right Wisconsin, gleefully reposted it! “And by shootings I don’t mean thugs shooting off guns in the air. I mean shootings where bullets pierce human skin, destroying flesh, bones, organs and lives,” wrote Kass. “On average, 12 people are shot in Chicago every day.”As comedian Larry Wilmore pointed out in 2015, “thug” is the word conservatives use now that they’ve realized that “ni**er” is out-of-bounds. Furthermore, he resists calling black men “men,” but continually refers to them as “boys.” This echoes a racist means of dishonoring and dehumanizing black men —calling them, no matter their age, “boy.”But Kass doesn’t even attempt to cloak his disdain for the black community and what he perceives as the damage done by our country instituting a social safety net half a century ago. Kass’ argument here is essentially that black people are lazy and Democrats and liberals want to give them “free stuff” — another favorite conservative trope. African-Americans, they say, have latched on to the welfare system an alternative to work. “Now, there aren’t enough jobs for unskilled labor,” he moans, as if black workers are incapable of any other kind.